Sarah Fuller, 32,died of an overdose last year at her home in Stratford. "Basically, you know, they set her up to die." She will say this in Washington on Tuesday because she has proof: a 2015 audio recording of a drug industry representative pretending to work for the Cherry Hill doctor who was treating Sarah Fuller. On the recording, the rep can be heard misrepresenting Sarah's diagnosis so that she could receive one of the most powerful and deadly opioids on the market. The motivation? This drug, approved only for cancer patients, costs over $20,000 a month. In Sarah Fuller's case, the bill to taxpayers came to more than a quarter-million dollars, since she was disabled and covered by Medicare. That recording is the most explosive part of a report McCaskill released about the actions of Insys Therapeutics Inc., the company accused of setting up an entire department to divert calls and feed insurance companies false details about patients to qualify them for a drug approved only for cancer pain so severe that it "breaks through" other medicines. McCaskill has been investigating the roles that five pharmaceutical manufacturers, including Chandler, Ariz.-based Insys, played in fueling an epidemic that has killed more than 180,000 Americans since 1999. Over the summer, the Missouri Democrat she added four — among them Endo International of Malvern and Teva Pharmaceuticals, with North American headquarters in North Wales — along with the three dominant distributors of prescription medications, including AmerisourceBergen Corp. of Chesterbrook. Sarah Fuller, 32, died on March 25, 2016, at the home she shared with her fiance in Stratford. Fentanyl has soared to the top of the list of opioid killers in the United States. Though it can be a legitimate medicine, it also can be made and distributed illegally. Cartels from China have produced and shipped the illicit product, and dealers here mix it with heroin and other drugs, lowering their cost and increasing their potency. Fentanyl is estimated to be 50 times as powerful as heroin; Pennsylvania coroners detected it in the bodies of more than 2,000 accidental overdose victims last year, according to an analysis by the U.S. Drug Enforcement Administration's local division. While illegal fentanyl is responsible for the overwhelming majority of deaths, pharmaceutical brands also are dangerous and tightly regulated. Subsys, a brand that is sprayed under the tongue and absorbed quickly — a new dose must be given every four hours, round the clock — was approved in 2012 for cancer patients with breakthrough pain. The U.S. Food and Drug Administration added bold warnings and requires prescribers to receive special training. Insys has been implicated in numerous state and federal investigations involving the marketing of Subsys, the only drug it has on the market. FBI agents arrested a former CEO and five other executives last year on charges that they bribed physicians to prescribe Subsys. The 31-page report released by McCaskill, the ranking Democrat on the Senate Homeland Security and Governmental Affairs Committee, pulls together previous investigations under the title "Fueling an Epidemic: Insys Therapeutics and the Systemic Manipulation of Prior Authorization." In a statement released in response to the report, Insys said it has "cooperated extensively" with the investigation. "The report relates to activities of former employees of our company and matters that the company has addressed in its own efforts and in connection with investigations by the Department of Justice and state attorney general offices," it said, noting that it had "invested significant resources in establishing an effective compliance program" that would "ensure high standards of integrity from our current employees." Insys also released a letter to McCaskill from Saeed Motahari, its president and chief executive officer. According to the Senate report, FDA efforts to limit distribution of Insys' sole product led pharmacy benefits managers to approve only about 30 percent of requested reimbursements for the $20,000-a-month drug. "In response to these challenges, Insys allegedly created a prior authorization unit, known at one point as the Insys Reimbursement Center (IRC), to intervene," the report says, and "boost the rate of Subsys authorizations." Employees claiming to be from doctor's offices used a toll-free phone number — later traced to Insys — to call benefits managers and give false information about patients. Approval rates more than doubled. Elizabeth Gurrieri, the former head of the IRC, pleaded guilty "to having conspired to defraud insurers" in June. Envision: Thank you. Is it also for the breakthrough cancer pain or not? Insys: Well, there's no code for breakthrough cancer pain. Envision: Yeah, and that's fine. I typed out the description; I just want to make sure that I heard you correctly. Insys: It's for breakthrough pain, yeah. Fifteen months later, with Subsys arriving monthly by FedEx, Fuller's fiance found her unresponsive at their Camden County home. A toxicology report found fentanyl in her blood. Deborah Fuller holds her favorite photo of daughter Sarah, dressed for Halloween. Richard Hollawell, a personal-injury attorney in Marlton, obtained the audio recording from Envision in response to a subpoena for a civil suit he filed against Insys on behalf of Fuller's estate in March, and turned it over to McCaskill's committee. He is expected to testify at next week's hearing, which the senator announced on Thursday. Hollawell also has sued Teva over the role that the marketing of its own brand of fast-acting fentanyl, the Actiq "lollipop," allegedly played in the death of a man in Philadelphia. Hollawell's "heart sank," he said, when he listened to the recording. Then he called Deborah Fuller. "One of the most difficult things I ever had to do was play that call for her," the attorney said. "I still hear that [recording] in my head," Fuller said. "Basically, you know, they set her up to die." Sarah's wedding day was to have been Aug. 18. "So instead of going to the church and having a nice reception, we went to the cemetery," her mother said. "Her fiance left flowers, my daughter and I left wedding balloons, and my husband left two giant champagne flutes and a cake topper." 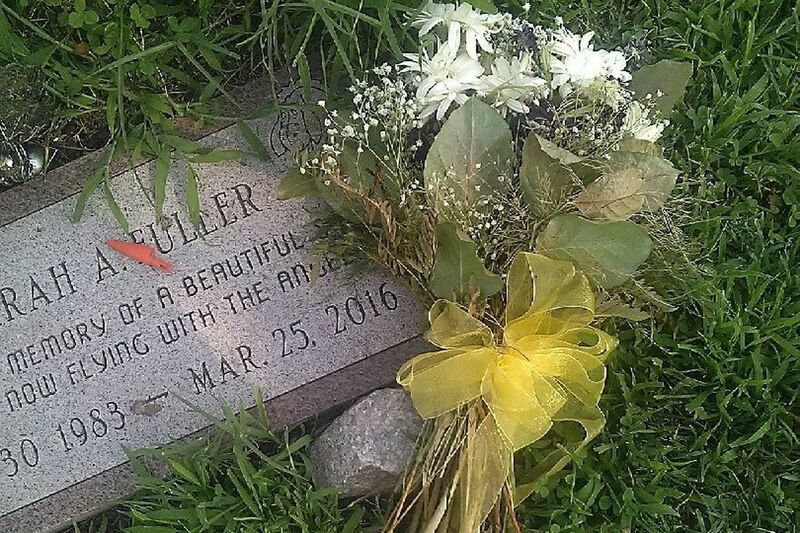 On Aug. 18, the day that Sarah Fuller had planned to be married, her family went to Berlin Cemetery instead. Her fiance left flowers. Her mother and sister left wedding balloons. Her father came by with faux flutes of champagne and a cake topper for her grave.